This example shows how you can use imregister to automatically align two magnetic resonance (MRI) images to a common coordinate system using intensity-based image registration. Unlike some other techniques, it does not find features or use control points. 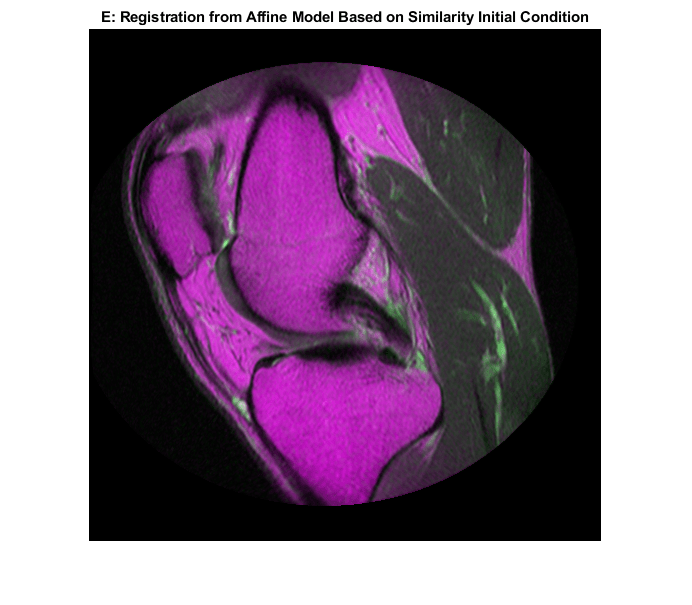 Intensity-based registration is often well-suited for medical and remotely sensed imagery. 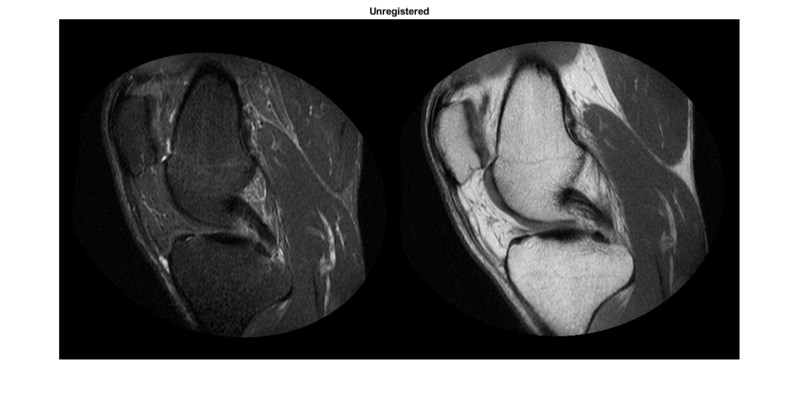 This example uses two MRI images of a knee. The fixed image is a spin echo image, while the moving image is a spin echo image with inversion recovery. The two sagittal slices were acquired at the same time but are slightly out of alignment. The imshowpair function is useful to visualize images during every part of the registration process. Use it to see the two images individually in a montage fashion or display them stacked to show the amount of misregistration. In the overlapping image from imshowpair, gray areas correspond to areas that have similar intensities, while magenta and green areas show places where one image is brighter than the other. In some image pairs, green and magenta areas don't always indicate misregistration, but in this example it's easy to use the color information to see where they do. The imregconfig function makes it easy to pick the correct optimizer and metric configuration to use with imregister. These two images have different intensity distributions, which suggests a multimodal configuration. The distortion between the two images includes scaling, rotation, and (possibly) shear. Use an affine transformation to register the images. It's very, very rare that imregister will align images perfectly with the default settings. Nevertheless, using them is a useful way to decide which properties to tune first. The initial registration is not very good. There are still significant regions of poor alignment, particularly along the right edge. Try to improve the registration by adjusting the optimizer and metric configuration properties. The optimizer and metric variables are objects whose properties control the registration. The InitialRadius property of the optimizer controls the initial step size used in parameter space to refine the geometric transformation. When multi-modal registration problems do not converge with the default parameters, InitialRadius is a good first parameter to adjust. Start by reducing the default value of InitialRadius by a scale factor of 3.5. Adjusting InitialRadius had a positive impact. There is a noticeable improvement in the alignment of the images at the top and right edges. The MaximumIterations property of the optimizer controls the maximum number of iterations that the optimizer will be allowed to take. Increasing MaximumIterations allows the registration search to run longer and potentially find better registration results. Does the registration continue to improve if the InitialRadius from the last step is used with a large number of iterations? Further improvement in registration were achieved by reusing the InitialRadius optimizer setting from the previous registration and allowing the optimizer to take a large number of iterations. 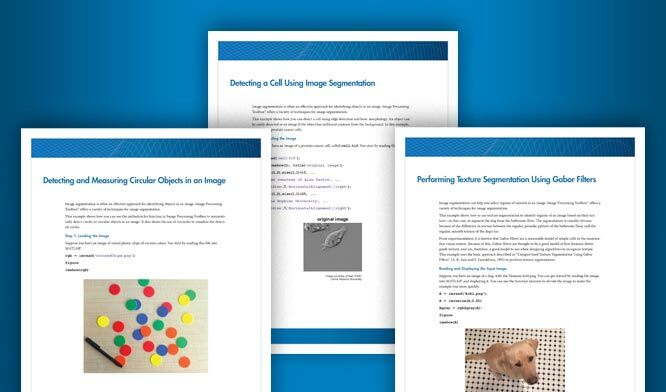 For more information about the multimodal optimizer and metric parameters that can be tuned, see the reference pages for the OnePlusOneEvolutionary optimizer and the MattesMutualInformation metric. Optimization based registration works best when a good initial condition can be given for the registration that relates the moving and fixed images. A useful technique for getting improved registration results is to start with more simple transformation types like 'rigid', and then use the resulting transformation as an initial condition for more complicated transformation types like 'affine'. The function imregtform uses the same algorithm as imregister, but returns a geometric transformation object as output instead of a registered output image. Use imregtform to get an initial transformation estimate based on a 'similarity' model (translation, rotation, and scale). The previous registration results showed an improvement after modifying the MaximumIterations and InitialRadius properties of the optimizer. Keep these optimizer settings while using initial conditions while attempting to refine the registration further. Because the registration is being solved in the default coordinate system, also known as the intrinsic coordinate system, obtain the default spatial referencing object that defines the location and resolution of the fixed image. Use imwarp to apply the geometric transformation output from imregtform to the moving image to align it with the fixed image. Use the 'OutputView' option in imwarp to specify the world limits and resolution of the output resampled image. Specifying Rfixed as the 'OutputView' forces the resampled moving image to have the same resolution and world limits as the fixed image. The 'T' property of the output geometric transformation defines the transformation matrix that maps points in moving to corresponding points in fixed. Use the 'InitialTransformation' Name/Value in imregister to refine this registration by using an 'affine' transformation model with the 'similarity' results used as an initial condition for the geometric transformation. This refined estimate for the registration includes the possibility of shear. Using the 'InitialTransformation' to refine the 'similarity' result of imregtform with a full affine model has also yielded a nice registration result. Comparing the results of running imregister with different configurations and initial conditions, it becomes apparent that there are a large number of input parameters that can be varied in imregister, each of which may lead to different registration results. It can be difficult to quantitatively compare registration results because there is no one quality metric that accurately describes the alignment of two images. Often, registration results must be judged qualitatively by visualizing the results. In the results above, the registration results in C) and E) are both very good and are difficult to tell apart visually.